Purina, a leading pet food manufacturer, was looking for opportunities to branch out from their staple food business into other pet care products. However, with pet store shelves already lined with thousands of existing products, Purina was unsure of how to differentiate themselves in such a market. Our objective was to immerse ourselves in the world of pets and their owners, and identify undiscovered needs and untapped opportunities, leading to new product and service offerings for Purina. We created emBARK, a brand that strengthens the relationship in a dog-owning couple through special social experiences. 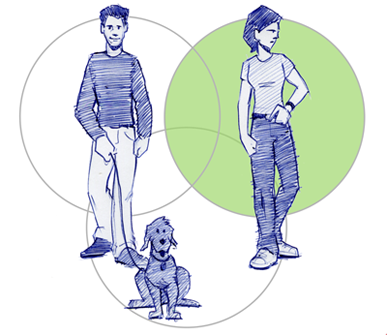 Initially targeting young couples as potential loyal lifelong Purina customers, we were surprised when our interviews and observations revealed high levels of relationship strife, unhappiness, and often even break-ups - all centered around the dog. 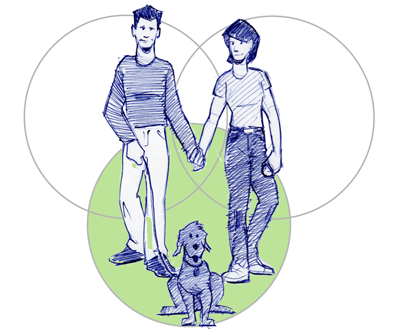 As we investigated, we found that differences in expectations and a lack of clear communication were responsible for much of the conflicts, and we began to form a point-of-view about the issue: By addressing these differences and aligning a couple’s expectations early in their relationship, we can help to prevent future conflict and create more happy dog-owning couples. It's not just about couples caring for their dog - but caring for each other as well. interviewed couples out for a walk, and roamed the aisles of pet stores. In the Step-Parent scenario, a partner in a new relationship with a dog owner may feel uncomfortable sleeping with the dog or letting it lick her face, while the owner feels forced to choose between his two loved ones. In the Adoptive scenario, a couple decides mutually to get a new dog. Couples often adhere to different rules govening the dog's behavior, and one partner might feel that he unfairly becomes "the disciplinarian".